The OnePlus 5 SmartPhone is yet another generation of the successful line of phones from OnePlus. Faster process, improved cameras and it runs Android 7.1. A faster phone that supports the latest version of Android. If you have owed a smartphone, you get the drill, have to get a new phone every few years to keep up with the ownership experience. While the OnePlus 5 sports a diagonal screen at 5.5 inches, this phone is 6.07 x 2.92 x 0.29 inches (154.2 x 74.1 x 7.3 mm). Not too different from prior generations of OnePlus phones. Since the dimensions haven’t changed much, there’s a good chance that your mount from a prior OnePlus might fit, but if upgrading from a smaller phone, it might be time to shop for a replacement mount. As is often suggested for expensive smartphones like the OnePlus 5, buy a case for it. We like the Otterbox Defender series which we reviewed here, and in the case of the Oneplus 5, they offer their new Achiever series of cases which is a worthy consideration. Get a good case that has two-piece construction for maximum protection. A single drop on ceramic tile that results in a broken lens will cost way more than the case. If you think insurance will cover you, think again. Insurance policies purchased from your carrier have a deductible and for newer more expensive phones that can be $169 on up. So to add insult to injury, you will not only be paying the monthly insurance premium, but you will then pay the deductible. You can read our article on phone insurance here. Bottom line: get a case. Let’s discuss some mounts for this phone. For the car, give the location of your mount some thought. There are lots of places to mount your OnePlus 5. The windshield is the most popular location to mount a phone especially if you plan to use it as a GPS via an app such as Waze. A good GPS app will work well on the big OnePlus 5 screen. A well made expandable mount is the Arkon Slim Grip Ultra Travel Mount. This mount features a cradle which expands to over 7 inches. Support arms on the top and bottom move so that you can expose any ports or buttons. This will fit your phone with or without a case or skin. The mount comes with an adhesive dash plate so that you can attach the it to your dash as well as your windshield. The phone can swivel into landscape or portrait mode although I find that I typically use this mount in landscape 90% of the time. A 2-year warranty comes with this mount. The Square Jellyfish Jelly-Grip Car Air Vent Mount is one that we have been recommending lately for smartphones and it will fit the OnePlus 5 well. It’s the mount seen in the photo that accompanies this article. The Square Jellyfish Jelly-Grip mount can be used to hold most phone models with or without a case or skin. It has a ball and socket so the cradle swivels into any orientation. This mount will work on flat vent slats that are 3/8 to 1 inch deep. The included cradle opens to 3 5/8 inches which is sufficiently sized for this phone. We are growing more fond of a CD player mount lately. There’s a good chance your CD player isn’t even being used so why not use it to mount your OnePlus 5. 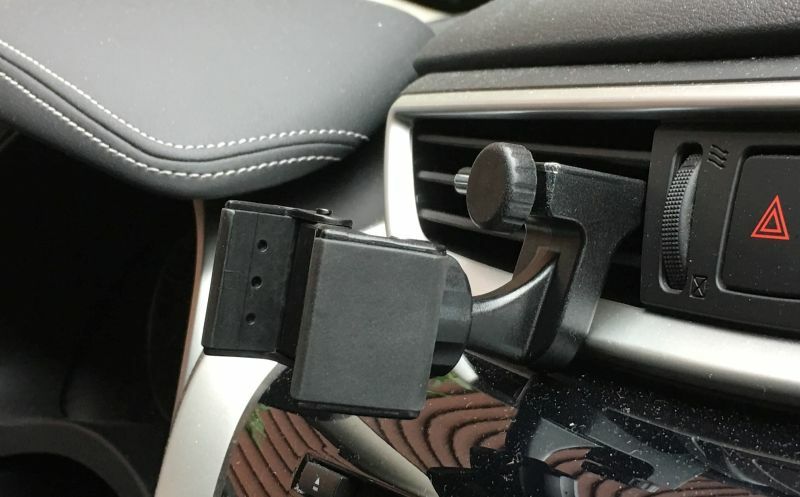 Consider the Mpow CD Player SmartPhone Car Mount. The back of the mount has several fins. Insert them into the CD player then twist the knob to tighten. It’s important that you not over-tighten to avoid damaging your CD player. The included cradle expands to fit your phone with or without a case. The OnePlus 5 has the rear camera located towards the top and the back doesn’t have a fingerprint reader so many motorcycle mounts will fit this model just fine. For motorcycle use, it’s important that you select a mount that includes a well made cradle that will hold your OnePlus 5 tightly. The phone must remain secure in high vibration environments like a motorcycle. We continue to like the RAM X-Grip line a lot for large phones with rear camera locations towards the top. These are heavy duty mounts that are mostly constructed of metal. The mount has gone through some rigorous shake tests and holds up well on a motorcycle. Most motorcycles can use the RAM X-Grip IV Handlebar Mount. These mounts feature the expandable X-Grip IV cradle which can open to 4.5 inches. RAM now includes a safety tether with these mounts which is an excellent added touch.